Does anyone have the recipe for buffalo wings? Preferably no frying required... Thinking of making this for ds' brithday party this weekend. Buffalo wings are Grilled..not fried. Anyway, its also spicy and a bit sour. Is that the one you want? the ones sold in restaurants only uses the drumlets. a bit of waste. so for home parties, you can have the whole wing. 1. Marinate chicken wings in the seasonings overnight. 2. Pat dry with kitchen paper towels before grilling. 3. Grill in preheated oven 220C for 25 to 30 mins. 4. Serve hot, dip into sauce. For a non-spicy version, I omitted Tabasco Sauce and replaced it with Tomato Ketchup(100ml) and added 50g sugar. the above picture is the non-spicy version. A very simple way to make buffalo wings, as what I've observed here, is to use melted butter mixed with hot sauce (hot sauce here is already sour) to marinate the wings or drumlets & bake in the oven. Another way is to deep-fry the wings first then mix the melted butter with hot sauce mixture to coat the fried wings. The deep-fried, then coated buffalo wings are reeeeally good. I've always wanted to try it out but never did. Must do it one of these days because it looked so tempting when I watched from the cooking show. Now that u confirmed that it's really good, then it's a must try for me! Thanks for the recipe, it was a hit. I made only 20 wings because no confidence, was thinking if it comes out werid, 20 wings not so much to throw. They just flew off the dish.. and without the sauce because I was too lazy to make that..
Only thing is, I forgot to buy the apple cider vinegar, so used basamic (sp??) vinegar.. taste wonderful. Glad that you like my recipe. Recipe was actually from a friend who runs his own Western food restaurant..had to modify it to post here as that recipe is exclusive to me only. next time make more and invite me also.. I used your recipe, and inspiried by your another "plum sauce chicken"; plum sauce, some butter (and more Tabasco) were added... 30pcs wings all gone... just by two guys! I'm making this halfway now. Just wondering, is the marinade for this wings watery instead of thick? Mine seems abit watery and light in colour. I'm gonna grill it tomorrow so I'm just wondering if it will turn nicely like yours when I grill it though the marinade seem watery. yes, its supposed to be watery..that is why in Step 2 of the Methods, stated that you must pat dry the wings before grilling. I finish grilling the wings already...Look really 'sedap' ler..heheheh. It looks really nice and evenly browned. I not eating it yet. Later only eat. 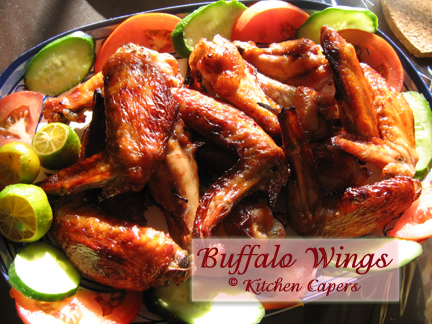 buffalo wings were first made at the anchor bar in upstate new york (buffalo, ny). they are easy to make, the sauce is just butter (or margarine) and frank's red hot sauce (tabasco sauce makes a good substitute). you just adjust the amount of hot sauce depending on how spicy you want it. UPDATE: I just made a batch using my non-recipe, by deep frying thawed frozen wings in hot oil for 10 minutes, then coated them with a butter and tabasco mix. they came out great. my baby daughter was sooo cute, she would beg for a piece, smack smack yum yum, then cry because it was too spicy, and beg for another piece, smack smack yum yum, then cry once more. hahaha this repeated until she ate 2 whole pieces.